In many cultures, in fact in most of the weddings that we took, rings plays a very important part in what most people will call, "Sealing of marriage vows"
It's true. Be it a Chinese wedding, Indian wedding, Malay wedding or even amongst other cultures ie: Western / Christian weddings. Of course there are variations to that theme like a necklace but rings take precedence in most weddings. 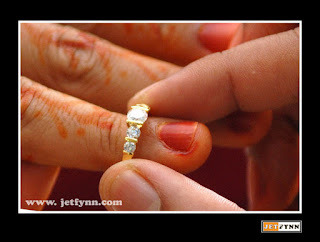 we use wedding ring in forth finger because it directly touch the heart.oh wow create a romantic relation between them.